NASH, it all comes down to this paper (thanks Liz). The dark staining patch is made up of neutrophils. 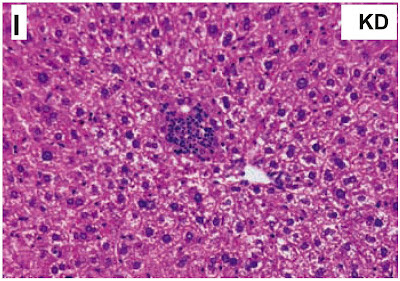 You don't want clumps of them aggregating in your liver. That's what you get if you feed F3666 to C57BL/6 mice. It is, undoubtedly, intensely ketogenic. But is it anything else? available information. Actual assay results may vary. For more information contact Jaime Lecker, Ph.D."
"The lipid composition of the different diets which induce steatohepatitis (see Table 4) [19,20,51,52,54], were lard and corn oil, both oils rich in unsaturated fatty acids. We can observe that fat of all the diets inducing steatosis and inflammation (Table 4) were richer in MUFA and PUFA (>30% and >20% of total fat respectively) as compared to our diet (5% and 2%). The injurious effect of unsaturated fatty acids, and particularly n-6 polyunsaturated fatty acids, was associated with enhanced lipid peroxidation and decreased concentrations of antioxidant enzymes, implicating oxidative stress as a causal factor. 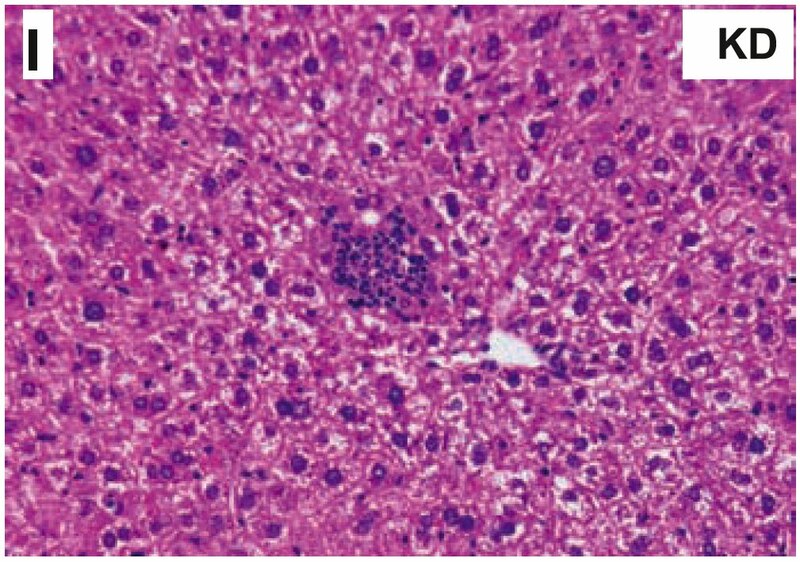 Indeed, different studies showed the pro-inflammatory effect of polyunsaturated n-6 fatty acids which exacerbate liver oxidative stress [60,61] and promote the development of NASH." It makes me wonder about saturophobes who might be swilling PUFA to lower their LDL and triglycerides, with or without a LC diet... More potential victims of the cholesterol hypothesis I suppose. Question: How do you convert a C57BL/6 mouse in to a FIRKO mouse? OK, well done, you can all put your clothes back on now and stop dreaming of UCP-1. "Thus, total heat output was 15% higher, averaged over 24 h, in KD animals (KD 0.538 ± 0.01 kcal/h vs. HF 480 ± 0.01 kcal/h, P < 0.05, n = 4). 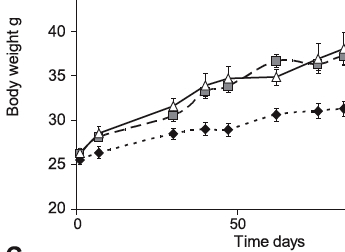 Oxygen consumption was increased by 34% averaged over 24 h (KD 4.370 ± 0.062 ml·kg–1·h–1 vs. HF 3.248 ± 0.052 ml·kg–1·h–1, P < 0.01, n = 4; Fig. 6C). Weight and CLAMS results were replicated in two additional independent cohorts using the same paradigm. CLAMS analysis also revealed that spontaneous dark-phase locomotor activity in KD animals was ∼30% lower than in HF animals." They also avoid the gym. Heard that before? We know that simply not eating for a while induces whole body physiological insulin resistance. We also know we can do exactly the same thing, without all the pesky death involved in sustained not-eating, by simply going in to deep ketosis without cutting calories. Ketogenic dieting is slightly controversial. 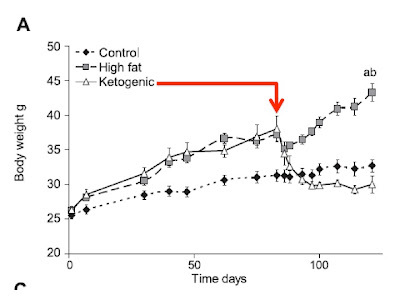 I've heard it said that the weight loss in these ketogenic fed mice is not real weight loss. I've even heard the change described as organ shrinkage. Interesting. The ketogenic mice become relatively hypoinsulinaemic and glycogen depleted. Do these affect lean bodyweight directly? "...energy is stored in the body as protein, fat, and glycogen, which is a form of carbohydrate. Any imbalance between the intake and use of these macronutrients will lead to an alteration of body composition since the stored protein, fat, or glycogen must change to compensate the imbalance. The energy stored per unit mass of carbohydrate, fat, and protein varies considerably, especially when accounting for the intracellular water associated with stored glycogen and protein.7 Furthermore, dietary carbohydrates have an effect on renal sodium excretion via insulin,60 which results in concomitant changes of extracellular fluid." 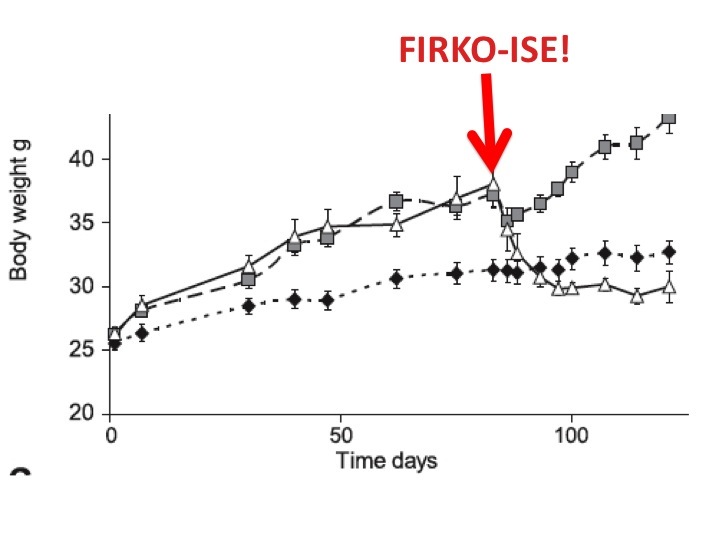 We know from the DEXA scans in Table 5 that ketogenic dieted, post-obese mice had a significant deficit (by mouse standards) of fat compared to the D12451 injured mice and most of it showed up in the whole body scans rather than the hind limb scans. This would suggest to me that they lost central, probably visceral, fat. I think we all pretty well agree that visceral fat is Bad Fat (maybe). It's usually the first to go on ketogenic dieting in humans. I don't see fluid loss or visceral fat loss as big worries. There seem to be a whole stack of benefits to sticking D12451 injured mice on to an extreme ketogenic diet. 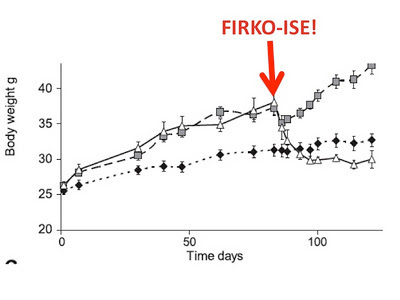 Real FIRKO mice live about 18% longer than CIAB fed mice. As we all know, there is a spate of new books out at the moment. I see that Dr Briffa is on Jimmy Moore's LLVDLC. John sent me a copy of Escape the Diet Trap and it almost immediately disappeared to my wife's mother, to be returned disappointingly rapidly a week later. She has, happily, bought her own copy. No one where she works believes a word of it. I like it. 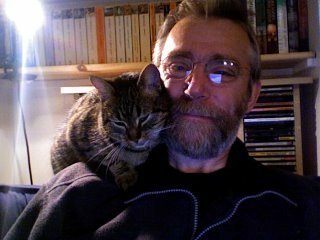 Anyone who has moved from Scotland to East Anglia will know how envious you feel browsing http://cairn-in-the-mist.blogspot.com/.